When this is all done, Intel might have wished it had kept Renee James as president and chief executive officer, because Ampere, an Arm server chip startup that James has been running since this spring, wants a big piece of the Xeon datacenter business and it has the financial backing to start a price war that others can win and only Intel can lose. For the past several years, we have watched as Intel’s hegemony in the datacenter grew, and while there is nothing inherently wrong with Intel selling the vast majority of processors that run most of the world’s computing workloads – monopolies are not illegal, bad behavior because of a monopoly is. 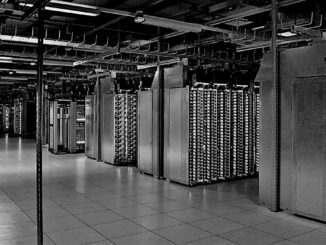 The vast monoculture of the X86 instruction set, the ever-advancing sophistication of the Xeon processor line, and two decades of price/performance improvements that no proprietary or Unix system vendor could keep pace with has done great things for general purpose computing in the late 20th century and the early 21st century. No question about it. But at some point, when the gross margins consistently stay close to 50 percent, as is the case with Data Center Group, and the server market share is so utterly dominated by Intel that most of the profit pools in server hardware flow to it, a capitalistic economy commands and demands that substitutes be created and sold for less money. Ampere is backed by giant hedge fund The Carlyle Group, which manages $170 billion in assets, and that money is how Ampere it bought the X Gene Arm server processor business from MACOM in the fall last year, which acquired that business from Applied Micro last year after the chip maker had run out of financial oomph to pursue the ambitious Arm server goals it set out in 2011. Applied Micro did the hard work of getting the first server-class Armv8 architecture done and promoting this as a possible option to a skeptical market. The initial “Storm” X-Gene 1 chip was implemented in the 40 nanometer processes from Taiwan Semiconductor Manufacturing Corp, and offered eight custom Armv8 cores running at 2.4 GHz, with out of order execution units and other server features. The X-Gene 2 was supposed to scale up to 16 cores with Ethernet RoCE networking interfaces, but it only made it into the field with eight cores running at 2.8 GHz despite the shift to 28 nanometer processors. Despite the difficulties, Applied Micro got 25,000 machines in the field using X-Gene 1 and X-Gene 2, and started work on the “Skylark” X-Gene 3 chip, which was a much more ambitious design and, incidentally, which was not completed when MACOM bought that chip business from Applied Micro or when the company that would become Ampere was funded by Carlyle Group. The Skylark chip was put on the public X-Gene processor roadmap in November 2015 and was revealed in more detail in October 2016. Applied Micro was shifting from 28 nanometer to 16 nanometer FinFET processes from TSMC with the jump from X-Gene 2 to X-Gene 3, which allowed for a substantial increase in core counts and a slight increase in clock speeds. The chip also included twice as many memory channels, at eight per socket, which doubled the memory capacity up to 1 TB of DDR4 per socket as well as doubling up the bandwidth. The X-Gene 3 chip had 32 cores plus a traditional L2 and L3 cache hierarchy; it also had integrated SATA I/O ports and 42 lanes of PCI-Express 3.0 peripheral bandwidth across eight controllers. Taylor says that using his back of the envelope math, the top bin 32-core eMag chip will stack up well against the Xeon SP and Xeon D lines. To be precise, Taylor says that this chip should be compared to the Xeon SP-6130 Gold, which has 16 cores running at 3.10 GHz with a turbo frequency of 3.7 GHz when only a few cores are lit up with work; this Intel chip comes in at 125 watts and costs $1,894. Ampere thinks it has twice the bang for the buck, since the Skylark has about the same raw performance and the same thermals. If you take the Skylake Xeon D chip aimed at hyperscalers and storage cluster builders, then the obvious comparison, says Taylor, is to the Xeon D-2191, which has 16 cores running at 1.6 GHz (without HyperThreading) and fits in an 86 watt thermal envelope for a $2,407. With a much lower price and more cores, the bang for the buck is going to be three times better with the eMag chip compared to the top end Xeon D.
Server maker Lenovo, which was initially skeptical about the use of Arm servers in the datacenter but which has embraced Cavium’s ThunderX2 in protoype systems, is getting ready to ship 1U and 2U rack servers based on the Skylark eMag chip, and later this year, in November or December, Ampere will be shipping its own whitebox servers based on the processor for customers who don’t have Lenovo on their preferred vendor list. Oracle is also talking up Ampere in the announcement, but has make no commitment to making servers based on the chip even if it is hinting that it may port its Oracle Linux and maybe applications and databases to Arm architecture by saying nice things about Ampere. Oracle did disclose to Wall Street that it has a 20 percent stake in Ampere, which cost it $46 million, and that means Ampere raised $230 million. At the moment, Ampere is being pretty vague about its product roadmap, and even the feeds and speeds of the first eMag chip and its SKUs because competing against Intel is a harrowing business, as all of the people at Ampere know full well. But Taylor dropped some hint. The one thing that would be fun to see happen is a big jump in cores and memory controllers, just to keep the heat on Intel with compute capacity and memory capacity and bandwidth. The fact is, many applications are bound by memory capacity and bandwidth, not raw compute. But adding more memory controllers to the die is a problem, which is why IBM was big on creating buffered memory for its Power8 and Power9 chips and only reluctantly added proper DDR4 controllers to the die. It would be fun to see 48 cores and a dozen memory controllers with eMag 2, boosting both memory and compute in lockstep, and maybe 64 cores and 16 controllers with e Mag 3, raising them both by 33 percent, and it would be even more fun for one of these future eMag chips would employ buffered DDR5 memory using SERDES links to the compute complex and remote DDR controllers in the buffer, as IBM is talking about for future Power chips. You might want to interview Intel employees about whether any of them wish Renee James was still employed at the company before leading with that hypothesis. It appears to be a central point to your thesis of the value-added differentiation of non-Intel CPUs.